An update of the classic moc stitch boot, you’ll be comfortable in this durable work western. So comfortable, they’ll have you on your feet from sun up ’til sun down. Just order half size larger. Double H boots wear the best of any I have tried (and that's been quite a few). They also fit great from day 1. Shoeline has been great about shipping and keeping the customer informed of their order. I've worn this style boot for many years, and there not available any more in my area. Glad I found shoeline. There a little pricey but I needed them right away, and they had them. I am going to purchase another pair of boots but I'll wait till they have them on sale. 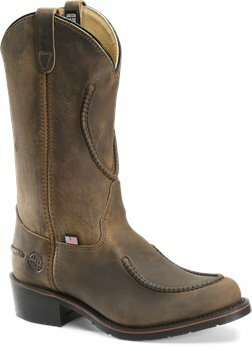 I would recommend them to anyone looking for a boots. Good boot still Made in the USA. BUT not as good as the 1608, BRING BACK THE 1608 !!! My husband loves this boot. Fits great. Good arch & very comfortable. They are very well made. He remarked that this is the only boots for him. This is a great boot but the older 1600 was a better boot (the lit tan color)I wore them for over 20 years and had no problems with them . And they WS only 85.oo dollop to start and the last one before you stop make them and switch to these was only like 120.00. But now these are featured one and are 200.00 one so we don't get to use any discount that you offer was is a buck of stuff. Husband really likes them but had to take insert out to fit him and is now having trouble getting them broke in. Really likes the style, just having issues with the fit. Excellent boot. I have worn DH for years and have many different styles. Shoeline is the best. This is my 3rd pair of Double H Boots in this style. The 1st pair were purchased 11/1982 and lasted until 02/1993. The 2nd pair were purchased 03/1998 and lasted until 07/2009. Each pair were re-soled once and re- heeled twice. This pair like the other two fit correctly right out of the box and required little to no break-in. I expect this pair will perform as well if not better than the last two since I’’m no longer working in the trades. 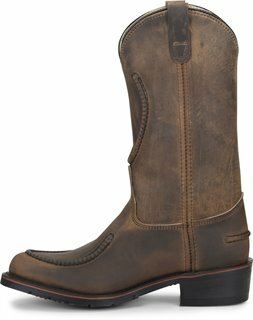 I would not hesitate to recommend these boots to anyone who wants a stylish yet fully functional work/play/semi-dress boot. Very comfortablehas an already broke in feel love the way they look. This was my first time ever ordering from this company but I didnt have any problems. I placed my order and within just a few short days I received my items. My husband has been wearing Double H boots for almost 18 years he loves them The hold up great and are very comfortable no breaking in needed. As always a great pair of boots they hold up very well and are comfortable right out of the box.